Allow the driver to move freely and easily. Allow riders to exit by any window or door in an emergency. Protect riders from injury if carryons fall or shift. Watch for cargo or baggage containing hazardous materials. Most hazardous materials cannot be carried on a bus. Riders sometimes board a bus with an unlabeled hazardous material. They may not know it is unsafe. Do not allow riders to carry on common hazards such as car batteries or gasoline. The Federal Hazardous Materials Table shows which materials are hazardous. They pose a risk to health, safety and property during transportation. The rules require shippers to mark containers of hazardous material with the materialʼs name, ID number and hazard label. 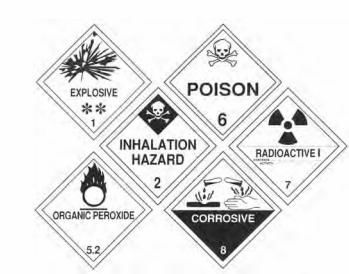 There are nine different 4-inch, diamond-shaped hazard labels like the examples shown in Figure 4-1. A chart showing all the labels is in the back of this manual. Watch for the diamond-shaped labels. Do not transport any hazardous material unless you are sure the rules allow it. Division 2.3 POISONOUS (Toxic) GAS. Division 6.1 EXTREMELY DANGEROUS POISONOUS (Toxic) LIQUID. More than 45 kg (100 pounds) of a solid Division 6.1 Poison. More than 225 kg (500 pounds) total of allowable hazardous materials and no more than 45 kg (100 pounds) of any one class. No rider may stand forward of the rear of the driverʼs seat. Buses designed to allow standing must have a 2-inch line on the floor or some other means of showing riders where they cannot stand. This is called the standee line. All standing riders must stay behind it. Remind riders to take carry-ons with them if they get off the bus. If the aisle is on a lower level than the seats, remind riders of the step down. It is best to tell them before coming to a complete stop. Charter bus drivers should not allow riders on the bus until departure time. This will help prevent theft or vandalism of the bus. Name some things to check in the interior of a bus during pre-trip inspection? What are some hazardous materials you can transport by bus? What are some hazardous materials you cannot transport by bus? What is a standee line? What three kinds of emergency equipment must you have? What is the minimum tread depth for front tires? Study sections 4.1 and 4.2 if you can't answer all of these questions. Proper storage of carry-on luggage is something you'll need to know for the written exam. Pay special attention to the previous two sentences as well as the list below. While you should be aware of hazardous materials which are prohibited on busses, you should especially pay attention to which hazardous materials are allowed on busses. Make sure you are very familiar with what the standee line is. This will very likely appear on your written exam. Especially remember that no rider may stand in front of the standee line. Which of the following hazardous materials is a bus allowed to transport? Buses may carry small-arms ammunition, emergency shipments of drugs, chemicals and hospital supplies. You can carry small amounts of some other hazardous materials if the shipper cannot send them any other way. Even if you don't plan to obtain a passenger endorsement for your CDL, you will still be required to have a basic understanding of some general rules and regulations for transporting passengers. On a commercial bus what is the standee line? No rider may stand forward of the rear of the driver's seat. Buses designed to allow standing must have a 2-inch line on the floor or some other means of showing riders where they cannot stand. This is called the standee line. All standing riders must stay behind it. When transporting passengers on a bus, when may passengers leave carry-on baggage in a doorway or aisle? No obstacles should ever block an aisle or doorway which may trip other riders. 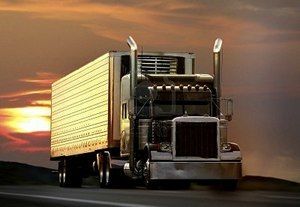 Even if you don't plan on obtaining a CDL passenger endorsement, you will still required to have an understanding of some basic passenger rules and regulations for the written exam.